Would Balloon Hoax Be Pathological, or Just Greedy? Long before law enforcement labeled the so-called Balloon Boy episode a publicity stunt, many suspected the Richard and Mayumi Heene's role in the weather balloon chase across northern Colorado had something to do with attention. 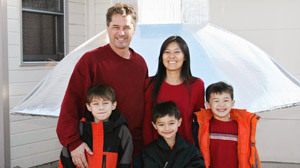 To some, it seemed coincidental that a family who promoted their storm chasing hobby and appeared twice ABC's reality TV show "Wife Swap" suddenly had hours of national media attention focused on their 6-year-old son Falcon and their homemade balloon. But experts disagree about whether such an alleged stunt that triggered a 50-mile long helicopter balloon chase, would be a pathological cry for attentionor just a greedy self aggrandizing play for a paycheck. "It's fair to say that there are personality disorders that are attention-seeking and media is the hyperbole of attention -- and you can't get more attention in a shorter period of time than you can on national media," said psychologist Pamela Rutledge, director of the Media Psychology Research Center. "Whether it's pathology or a normal amount, it [attention] is a validation," she added. "At what point does something cross the line on healthy and unhealthy? It depends on the situation." As more details will likely come to light in the coming weeks, there is already disagreements about whether the situation in the Heene home in Fort Collins, Colo., is healthy. Larimer County officials have asked Child Protection Services to investigate the Heene family, including Falcon's brothers Ryan, 8 and Bradford, 10. Over the weekend, Sheriff Jim Alderden said he was preparing to file charges against Richard and Mayumi Heene, but arrests, if any, are not expected until next week, according to The Associated Press. The lawyer for the Heene family did not return messages seeking an interview with ABCNews.com. "I worry that we don't put this family into a cookie cutter box," said Frank Farley, former president of the American Psychological Association, and a specialist in risk-taking and thrill-seeking behavior. Farley said he's heard plenty of talk of narcissism surrounding the Heene family, but "if we're going to use the term narcissism for attention-getting, it means we have a lot of it in our country," he said. Are Attention-Seeking Stunts the American Way? Farley was quick to point out examples of this -- such as when Orson Welles triggered mass panic in 1938 when he read an adaptation of H.G. Wells' "War of the Worlds" on national radio. The fake newscast convinced millions that Earth was being invaded, and it became a breakthrough event for the Welles' career. "This is an extroverted, thrill-seeking nation. I would expect this more likely to happen in America than, say, in Iran," he added. But while Farley sees this extreme bid for attention in reality TV as a marker of the nation's inventive, exploratory nature, others see it as a problem. "It's different than a clinical way that someone speaks about attention-seeking," said psychologist Jenn Berman, author of "The A to Z Guide to Raising Happy, Confident Kids." "I think it is symbolic of a bigger societal problem of attention-seeking behavior," she said. To Berman, reality TV is an example of a new form of attention-seeking: fame for being famous. "More and more people need to get attention not for accomplishments, but just to get attention," said Berman. "It's hard to know what came first, the chicken or the egg, but I do think reality TV fuels it." Yet, Rutledge, who studies the interaction between psychology and modern media, says it's not the attention-seeking behavior that sent the nation's blood boiling, but the possibility that a hoax violated the public's good will. More to the Story Than Attention? "It seems to me that they crossed a line by making people think that the child is in danger," said Rutledge, who added that it's a very primal urge to worry about the safety of any child. "You know, they say any publicity is good publicity, but I'll be really interested to see whether transgressing that social norm is enough of a violation to people that this backfires," she said. ABC News' Sarah Netter and Russell Goldman contributed to this report. Hoaxsters: Pathological, or Just Greedy?